You can train this skill half 'n half AFK. You will need to check in from time to time. It took me 3 afternoons and 2 evenings (although I was still figuring out the best approach). Please don't feel threatened by the large amount of text. You only need to read it once . First you will travel to Buccaneer's Den to see Bonny the thief Guildmistress in the Pirate's Den and have her teach you the basics of Remove Trap. You will end up with about 33.0 points. 1. A carpenter/tinker that can make you 15 small crates (8 wooden boards each) with lock keys. 2. An owned house you can stack the 15 small crates in. 3. A leveling tinker character of max. level 50 to start out with. 4. A whole bunch of ingots and crossbow bolts for setting the dart traps. 5. A bunch of tinkering tools. 6. Patience and time. I advise some Netflix on the side. If you can, get your hands on a couple of magic clothing pieces which give you extra Remove Trap skills. If you can make it to level 45 to 50 with clothing, that would be great to start out with. It's best to get both low and high skilled clothing pieces for different parts of the body so you can mix 'm up while you're training. Your tinker will gain tinkering slowly with placing traps, so with exchanging magic clothing you can stay around the same level as your tinker while you train. If you are in the NEW guild, you can get them from the Clothing Hamper in the Guild Hall, be sure to return them when you're done. Or ask around. Somebody will surely help you out. Don't panic though. If you don't have access to magic clothing, you can also start out with a level 30 to 40 tinker to lock your boxes. Remove Trap skill: 33 - 45 ? Have a level 30 tinker lock the boxes with dart trap. Remove Trap skill: 45-65 ? Have a level 50 tinker lock the boxes with dart trap. Remove Trap skill: 65-75? Have a level 70 tinker lock the boxes with dart trap. Remove Trap skill: 75-90? Have a level 80 tinker lock the boxes with dart trap. Remove Trap skill: >90 ? Have a level 100 tinker lock the boxes with dart trap. - Your tinker will gain in level too as he/she places traps, but that's okay. It's slow and won't keep up with you gaining Remove Trap. Obviously if it's too slow, you can always quickly have your tinker gain some skill separately. It is quite quick and doesn't cost a lot of extra ingots. - Remember, you can higher up your skill with magic clothing when the tinker is higher in level. You will need to make a couple of macro's beforehand, to make it easier for yourself along the way. It will take a lot of mouse clicking and targeting, but once you're done, you will be happy you did. Imagine having to do this every time you needed to lock/unlock a box, set a trap to it and release/secure it *faints* . Have the tinker create a macro to set a dart trap to all 15 boxes. - Have the tinker tool open, select Traps in the left menu, then Dart trap on the right for the first box. For the other 14 you can use "make last" on the bottom. Save the macro. Have the tinker create a macro to lock all 15 boxes. This same macro can also be used to unlock them. - Double click the key in the bag, then choose the corresponding box. Do this for all the boxes and save the macro. -type in: I wish to secure this press enter and choose the first box. Press CTRL+Q to repeat what you just typed and hit enter to choose the next box. Continue until you secured all boxes. Save the macro. -type in: I wish to release this press enter and choose the first box. Press CTRL+Q to repeat what you just typed and hit enter to choose the next box. Continue until you released all boxes. !! !Don't forget to secure the boxes again after setting this macro!!! Finally, have the character that goes to learn Remove Trap make a macro to do Remove Trap on all 15 boxes. Now your character can just stand in front of the 15 boxes and loop the Remove Trap macro. Take note that your Tinker won't be able to trap all boxes in one try with the macro at first. You may have to use the macro a couple of times, or unlock / trap / lock the remaining boxes manually, or just leave it. It's up to you. 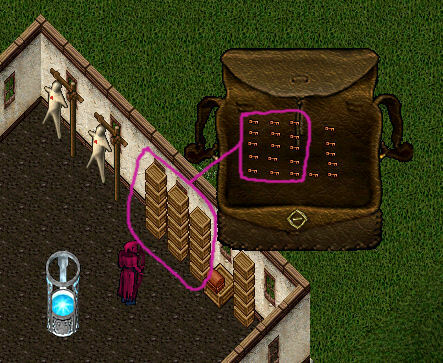 When you notice your character is untrapping most boxes in one attempt, either take off some magic clothing that adds skill to Remove Trap or train the Tinker a bit higher so the traps become more difficult. If you have the luxury of a second account and you have the Tinker on that second account, you can have the said Tinker standing by while your character tries to remove traps. It speeds things up, because you don't have to keep changing characters. Make sure all boxes are released. Because you're working with them, they won't disappear on you. !! !Don't forget to secure them when your Tinker takes a break!!! Your journal will tell you when your character has or hasn't untrapped a box. You had your character name the box he/she was trying to untrap in the Remove Trap macro, so you'll know exactly what box your Tinker needs to work on. Your tinker can then jump in by manually unlocking the box, trapping the box and locking the box again (no macro). So your character in training can continue his training without stopping the Remove Trap macro. If you have any questions or feedback or need help, feel free to either respond in this thread or PM me ingame, on discord or here on the forums. You can just cast magic trap on a box and disarm it? @ Aquantus Can you verify this?